Chokers are a 90’s fashion staple. They’re making a comeback as they continue to be bold statement pieces made from either delicate lace to faux leather ropes set with gold, silver or crystal trimmings. Chokers give the extra edge. 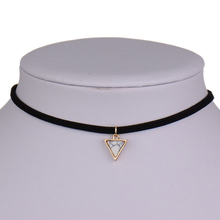 Our women's black chocker collection will help bring out your inner rock star.